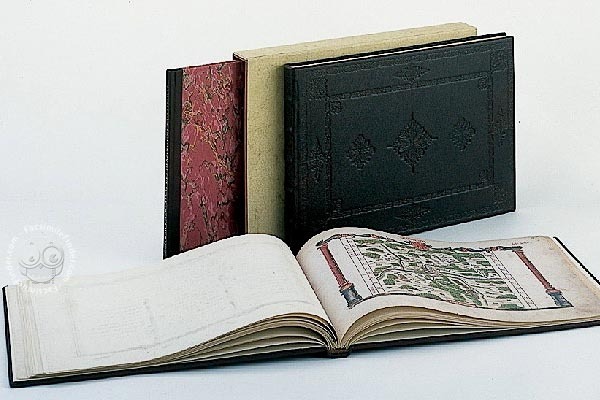 The manuscript comprises the oldest know Atlas of the former Duchy of Wuerttemberg. Its 52 minutely designed and lavishly coloured charts depict the districts and places of Wuerttemberg, then under ecclesiastical or secular administration, leaving out, however, the imperial free cities. The maps are drawn in bird’s-eye perspective; towns and villages, hamlets and farmsteads, rivers and woods, valleys and hills are characterised in outline. 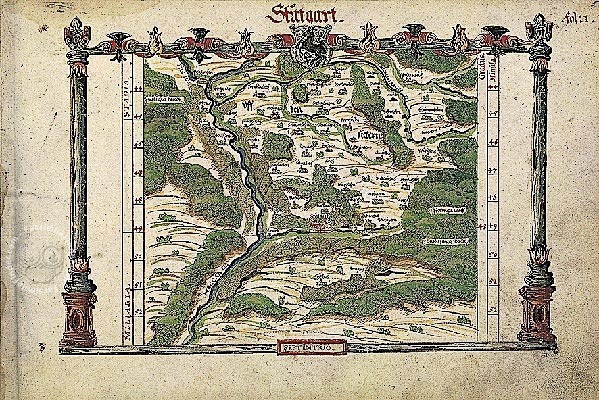 Like other charts of the time the Atlas of Wuerttemberg displayed, the world with a different standard then the one used today, with North at the foot of the page, South on top, West on the right and East on the left. The work of the office father from southern Wuerttemberg, Heinrich Schweickher(1526–1579) is an outstanding achievement of its time. All later maps and charts of the region go back to this elementary work. Manuscript book on parchment − 38 × 25.5 cm − 114 pp. Full-size color reproduction of the entire original document, Heinrich Schweickher: Atlas Of Wuerttemberg 1575: the facsimile attempts to replicate the look-and-feel and physical features of the original document; pages are trimmed according to the original format; the binding might not be consistent with the current document binding. Dark leather with blind tooling.